previous post: Less income, less work, less income, more work! Today I provide some alternative insights to to recent (not so) Nobel prize awards in Economics. It is claimed that the work of the three winners has “conferred the greatest benefit on mankind” (being the criteria for the award). The reality is that the major insights to be drawn from this trio is that mass unemployment does not exist and that unemployment is largely voluntary or a function of over-generous income support policies by “misguided” governments. The policy recommendations to be drawn from their work focus on cutting the meagre benefits that governments provide to the unemployed in times of strife. The winners’ work tells us that they think workers are lazy and do not search effectively enough, in part, because they have it too good in their jobless state. I rank their work among the most distressing and obscene of all the disgraceful con jobs that the mainstream of my profession has deliberately foisted on the public policy process. First, we should be clear on what the grand-sounding Nobel Prize in Economics is about. The uninformed might be seduced into thinking this prize is part of the tradition established by Alfred Nobel in 1895. You would be wrong. It is in fact a conservatively-biased award that is not part of the Nobel Prizes set out in Alfred Nobel’s will. The status of the Economics Prize clearly comes from it being mistakenly associated with the legitimate awards established by Nobel. In fact, it was established in 1968 by the ultra-conservative Swedish central bank and the prize is awarded by the Royal Swedish Academy of Sciences. … those who … shall have conferred the greatest benefit on mankind. In the case of the non-Nobel Economics prize the criteria seems to be largely to those “who have damaged people the most through their errant input to the policy process”. There have been many calls to have the economics prize abandoned given it has displayed a strong bias over the years to mainstream economists, Many of these economists have had a pervasive influence on economic policy which has led to policies that have unambiguously worsened the prospects of humanity. The sort of policies that have led to the current crisis are consistent have been influenced by the body of work that the 2010 prize is recognising as worthy of this award. Even Alfred Nobel’s descendants (for example, his great-grand nephew who is a human rights lawyer) has constantly sought to have the award scrapped. More Chicago school economists have won the award than any other university. There was huge controversy when right-winger Milton Friedman was awarded the prize in 1976 for his work on monetarism. The previous year he had worked with Chilean dictator Augusto Pinichet to provide the blueprint for that governments brutal oppression of the workers and the imposition of harsh economic policies. Milton Friedman did not confer the greatest benefit on mankind in 1976 or any year. So my view is that the prize does not recognise insightful or great work. It is a reward for those who reinforce the conservative neo-liberal paradigm (mostly). I note that 2008 Nobel Prize winner Paul Krugman was effusive in his congratulations – HERE. I suppose they all have to stick together to talk up the prize so that people do not realise the whole process is a conservative farce. Full disclosure: this is not an area I know as well as I should. But I think I know enough to give a quick read. So never mind being on top of the literature and actually having a full appreciation of the implications of the work being “honoured” – the fact that the conservative committee bestows the award seems to be sufficient to make the work worthy. Whatever! … why the unemployment rate isn’t zero at “full employment” … It shows that structural unemployment is a real issue, and that the volume of structural unemployment shifts over time. It also shows, however, that short-term movements in unemployment are overwhelmingly the result of overall shocks to demand — in effect, Keynesian business cycles. I also considered the UV curve and its movements in this blog – Extending unemployment benefits … an omen. 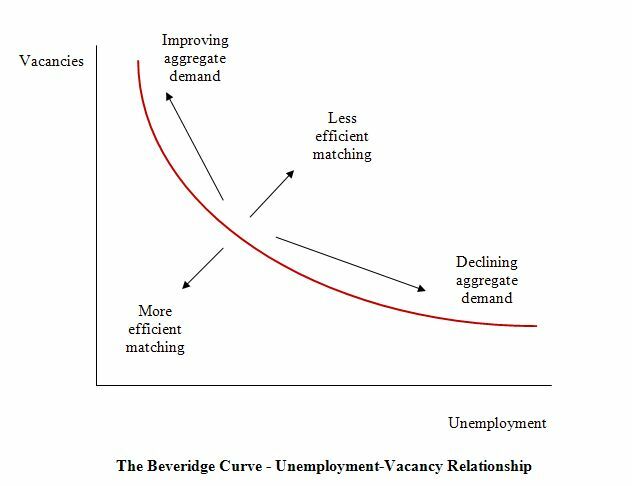 Economists have long used the unemployment-vacancy (UV) relationship, the so-called Beveridge curve, which plots the unemployment rate on the horizontal axis and the vacancy rate on the vertical axis to investigate these sorts of questions. The following diagram is the usual depiction of the UV relationship with vacancies on the vertical axis and unemployment on the horizontal axis. The red line is a UV curve at some point in time. The logic is that movements along the curve are cyclical events and shifts in the curve are alleged to be structural events. So a movement “down along the red curve” to the south-east suggests a decline in the number of jobs available due to an aggregate demand failure, while a movement “up along the red curve” indicates improved aggregate demand and lower unemployment. If unemployment rises in an economy where there are movements along the UV curve it is referred to as “Keynesian” or “Cyclical” unemployment – that is, arising from a deficiency in aggregate demand. The search literature claimed that “shifts in the curve” (out or in) indicated non-cyclical (structural) factors were causing the rising falling unemployment. The prize winners claimed this meant that if the UV curve was shifting out then the labour market was becoming less efficient in matching labour supply and labour demand and vice versa for shifts inwards. The factors that were claimed to cause increasing inefficiency were the usual neo-liberal targets – the provision of income assistance to the unemployment (dole); other welfare payments, trade unions, minimum wages, changing preferences of the workers (poor attitudes to work, laziness etc). The solution? Cut benefits, toughen activity tests, eliminate trade union influence, abandon minimum wages and reduce any subsidies that prolong the search propensity by workers. That is the so-called insights these characters have been given one million pounds for! Total farce really. The theoretical underpinning of the UV curve is usually provided by mainstream economists through search theory which focuses on matching functions (between labour supply and demand). This is the focus of the work of the three prize winners. The search theorists typically assume some “linear matching function” which leads to them stating that the change in unemployment is equal to those leaving employment plus the increase in the labour supply minus the efficiency of the matching process. So if matching becomes less efficient then unemployment rises for a given level of unfilled vacancies. So in this theory, the UV curve shifts upwards with both mismatch and structural increases in layoffs. In my recent book Full Employment abandoned we provide a mathematic derivation of the way in which the search-theoretic approach argues. I won’t repeat that derivation here. The intuitive explanation is as follows. Workers and firms are continually looking for each other – searching. The workers have a reservation wage (the minimum that will induce them to forego leisure and accept a job). This wage is conditioned by the alternative sources on non-work income available – including welfare benefits. The workers search for jobs and will take a job if it exceeds the reservation wage. So unemployment is conceived as being a voluntarily-chosen search process where the worker samples wage offers in the labour market seeking to maximise his/her outcomes. The worker is conceived as being in control. If they do not want to be unemployed they can always accept a wage offer and this may require them to lower their reservation wage. Prolonged unemployment is thus voluntary and because it is claimed to be an optimal outcome does not require any policy intervention. Accordingly, the persistently high unemployment becomes an equilibrium phenomenon, reflected by rising natural rates. This equilibrium allegedly follows from maximising decisions by individuals in the context of various anti-competitive institutional arrangements in the labour market (wage setting mechanisms and trade unions) and government welfare policies (encouraging people to engage in inefficient search). The policy implications of the approach is that government policy can distort the individual optimising decision-making. How? Answer: by subsidising the reservation wage through the provision of alternative income support (unemployment benefits). The solution is to terminate unemployment benefits (or reduce them) which then will lead to the worker seeing a wider range of job offers as being relevant. What if there is a severe shortage of jobs? Answer: this obvious real world problem is assumed away – there is only a matching problem. There are always enough jobs and unemployment is just about how the worker calibrates his/her reservation wage and the effectiveness in which they search. So lazy workers do not search hard enough and policy should toughen activity tests to make sure that search efficiency rises. The mainstream economists then sort empirical validation of their nonensical ideas by examining “shifts in UV curves” in many countries. It is clear that for many countries the UV relationship has shifted several times over the last 40 years or so. …. workers have become more choosey in taking jobs, or firms become more choosey in filling vacancies (owing for example to discrimination against the long-term unemployed or to employment protection legislation). They suggest that the first reason dominates. There is clearly an observational equivalence problem in attempting to test for this. Search time will lengthen when there are large cyclical downturns and the probability of gaining a job decreases. When UV ratios rise due to a major shortage of jobs, it is a fallacy of composition to conclude that if all individuals reduced their reservation wage to the minimum (to maximise supply-side search effectiveness) that unemployment would significantly fall (given the small estimated real balance effects in most studies). Further, unless growth in labour requirements is symmetrical and labour force growth steady on both sides of the business cycle, the pool of unemployed can rise and remain persistently high. As an aside, I reckon LNJ will be really pissed off that they didn’t get the award for search theory development given they have been pushing it hard as well. However, the notion that there is a neat decomposition between shifts in and movements along the curve is highly contested and has not been reliably established in the empirical or theoretical literature. One of my earliest papers, which came from my PhD work was published in 1987 – ‘The NAIRU, Structural Imbalance and the Macroequilibrium Unemployment Rate’, Australian Economic Papers, 26(48), pages 101-118 – showed that structural imbalances (supply constraints) can be the result of cyclical variations and can be resolved, in part, by attenuating the amplitude of the downturns using fiscal policy. In other words, there is no decomposition as the mainstream would like us believe. 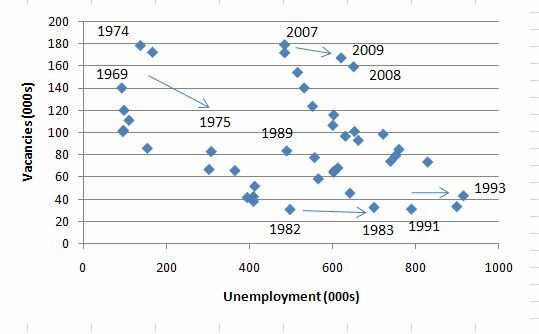 This is reinforced by work I did a decade ago where it is clearly shown that where the UV curve shifts, almost always the shifts were associated with major recessions which generated structural-like changes in the labour market. In other words, the shifts are driven by cyclical downturns (aggregate demand failures) rather than any changes in autonomous supply side behaviour (like worker attitudes changing, or welfare policy introducing distortions to incentives, etc). 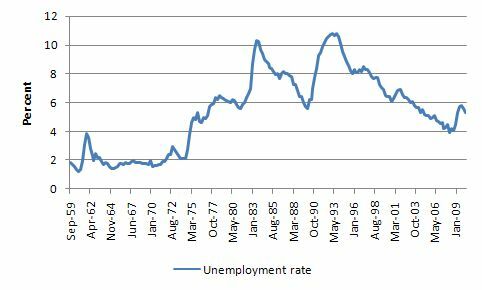 The following graph shows the evolution of the unemployment rate in Australia since 1959. The major cyclical events (mid-1970s, 1982, 1991 and 2008) are clearly demonstrated. I provide this graph as a reference to the next graph. The following graph which shows the UV curve for Australia (using annual data since 1967). I have dated some of the observations to show the dates where the outward shifts occurred. Relate those dates with the preceding graph (the evolution of the unemployment rate) and you will quickly conclude that the major shifts all occurred during a major cyclical downturn – that is, when aggregate demand collapsed and unemployment rose sharply. At these times, there was no major shift in any policies which the neo-liberals (and these Nobel prize winners) have identified as “structural impediments” to search-effectiveness. The Australian experience is replicated in every nation I have examined closely. The notion that the shifts in the UV curve are due to some policy-induced structural deterioration in search effectiveness beggars belief. To advance the view that the workers suddenly choose this sharp rise in unemployment and to try to influence policy to cut benefits during this period is in my evaluation a crime against humanity. Layard, Nickell and Jackman work along these lines was extremely influential at the time and basically provided the theoretical case for the OECD Jobs Study (1994) which served as the blueprint for labour market deregulation since the early 1990s and underpinned the pernicious welfare-to-work policies that many governments introduced in the last 15 years. Layard and Co repeatedly have claimed that the persistent unemployment over the last 20 years is the result of workers becoming “too choosy”. In Australia, the conservatives (when they were in government – 1996-2007) called the unemployed “job snobs”. Since 1994, the OECD has been constantly pressuring governments to abandon the hard-won labour protections which provide job security and fair pay and working conditions for citizens. They also deemed welfare payments including unemployment benefits to be disincentives to work. Please read my blog – The OECD is at it again! – for more discussion on this point. An examination of the empirical evidence over the period would suggest that the major claims made by Layard and Co (and the myriad of hangers-on that have followed them) do not bear scrutiny. While they claimed declining search effectiveness distorted by excessive generous welfare payments caused the rising unemployment rates prior to this recession, it is highly probable that both are caused by insufficient demand for labour. The policy response then is – of-course – entirely different and would emphasis fiscal policy expansion underpinning job creation. I have also published work using phase diagrams show the current values of the respective time series plotted on the y-axis against the lagged value of the same series on the x-axis. I first started using phase analysis in this 2001 paper – Exploring labour market shocks in Australia, Japan and the USA, which has since been published but you can get the free working paper version at the link provided. You will find reference in that paper to other relevant material if you are interested. These scatter plots are helpful in four distinct ways. First, the charts provide information on whether cycles are present in the data. Second, the presence of “attractor points” can be determined. The points might loosely be construed as the middle of each of the traced-out ellipses. Third, the magnitude of the cycles can be inferred by the size of the cyclical ellipses around the attractor points. Fourth, the persistence (strength) of the attractor point can be determined by examining the extent to which it disciplines the cyclical observations following a shock. Weak attractors will not dominate a shock and the relationship will shift until a new attractor point exerts itself. I won’t repeat the analysis here but if you construct phase diagrams for the unemployment rate and the vacancy rate you typically observe the following patterns. The attractor point shifts outwards for unemployment during periods of major aggregate demand failures (the cyclical episodes shown in the UV graph above) and the oscillate around the new higher point with varying cyclical magnitude. Once the attractor point stabilises (as the recession subsides) it takes several years to recover from a large negative shock. In terms of the vacancy phase diagram, you typically see a downward movement in the attractor point associated with these recessions. The search-theoretic approach would construe the outward shift in the unemployment relationship as a decline in labour market efficiency. That is, a deterioration in the matching function. Conversely, they would interpret the downward shift in the vacancy relationship as increasing matching efficiency. Clearly, both states cannot hold. A consistent interpretation can be found in the view that the two shifts are the result of deficient aggregate demand caused or exacerbated by poorly designed and implemented fiscal policy interventions. Once a major aggregate demand failure occurs, whatever endogenous supply effects that may follow in terms of skill atrophy and work attitudes are not causal but reactive. The phase diagram analysis suggests that to restore full employment, the economy needs a major positive shock of a sufficient magnitude to shift the current attractor point downwards. It is almost definite from the earlier analysis and related empirical work that we discuss in Full Employment abandoned) that this shock has to be aggregate and focused on the demand side. Interestingly, Layard (1997) himself cast doubt on the supply-side labour market policies that LNJ (1991) initially promoted and which were so zealously taken up by the OECD and governments around the world. If we seriously want a big cut in unemployment, we should focus sharply on those policies which stand a good chance of having a really big effect. It is not true that all polices which are good in general are good for unemployment. There are in fact very few policies where the evidence points to any large unambiguous effect on unemployment and … some widely advocated policies for which there is little clear evidence. Perhaps that is why he didn’t get the Nobel Prize for his work on search in preference to the others. His neo-liberal position is less clear now. The implementation of a Job Guarantee would be sufficient to shift the attractor down to levels consistent with full employment. So, once we try to decompose the UV curve into separable cyclical and structural components, problems arise because this framework assumes that structural changes are orthogonal to the business cycle. That is not a plausible hypothesis and it doesn’t stand up to empirical scrutiny. The so-called structure shifts are largely driven by the business cycle. So a reduction in aggregate demand will typically cause an outward shift of the UV curve. Endogeneity of behaviour also poses the problem of observational equivalence. For example, search time will lengthen when there are large cyclical downturns and the probability of gaining a job decreases. It is hard to blame individuals for their labour market outcomes when the unemployment to vacancies ratio rises because of the dramatic shortage of jobs. The search-theoretical approach thus has three major drawbacks. First, unemployment is seen as an excess supply buffer which serves to discipline excessive wage demands. There is no direct link between unemployment and capacity utilisation, which allows an increase in aggregate demand to adjust employment directly at the going wage rate and hence lead to a direct reduction in unemployment. In other words, there is no notion of involuntary unemployment. Therefore, one cannot represent mass unemployment at the macroeconomic level within this framework, which comes as no surprise given that it was inherited from the New Labour economics from the early 1970s. However, it is startling that models such as these are taken seriously when there is no explicit role for capacity utilisation as such in the economy. It is clear from any research that chooses to focus on the question, that aggregate demand is the single most important determinant of employment and hence unemployment cannot be assumed away as it is in the search-theoretic models. Unemployment therefore should be constructed as the systematic macroeconomic failure of governments to ensure there are enough jobs created in their economies. I briefly consider involuntary unemployment later. Second, the representation of the macroeconomic labour demand curve in these models relies on the discredited neoclassical derivation of a marginal product schedule. It is easy to show that even if such a schedule existed at a firm level it could be used by way of straightforward aggregation to derive an aggregate labour demand function where employment and real wages were inversely related. Following Marx and Keynes, aggregate employment is a function of the level of effective demand in the economy which is the level of spending and production which satisfies the profit rate aspirations of the producers and the planned savings of households. The standard neoclassical derivation of the aggregate labour demand function assumes that wages impact on costs holding other things equal. However, wages also impact on demand and changing wages thus shift both the aggregate spending and aggregate supply functions. The impact on effective demand (the intersection of the aggregate demand and supply functions) is uncertain but likely to be highly inelastic with respect to the real wage in normal output regions. The point is that one has to determine the point of effective demand before one can determine the macroeconomic level of employment. Third, the dominant position of the matching function in the search-theoretic models is problematic. The mere fact that it is not recognised that vacancies might also react to structural changes indicates that this approach is severely limited in its applicability. As noted above, the search literature denies (by omission) the concept of involuntary or mass unemployment. In yesterday’s blog I produced the Classical labour market which the search theory really builds upon rather than rejects. In terms of the Classical labour market, the clue to the concept of involuntary unemployment lay in the understanding that the labour market did not in isolation determine employment. Further, the quantity of labour supplied and demanded did not have to bear any relation to the ‘neoclassical’ optimal labour supply and labour demand schedules (even if the latter existed). The essential point is that the labour demand is derived from the product market as a reflection of demand for final goods. This is depicted in the diagram by the vertical line at E1, which represents the effective demand constraint on the labour market from the goods market. In neoclassical terminology, workers at B are willing to supply more labour even at lower real wages. In what sense do we say that a worker who is involuntarily unemployed is ‘powerless’ to change his/her situation? This is also a key question in understanding the distinction between voluntary and involuntary unemployment. 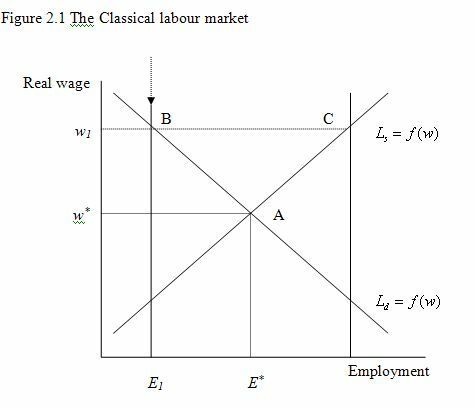 In terms of the diagram, the neoclassical construction is that at B workers should offer themselves at lower real wages to increase the demand for their services. But how does an individual worker do this? The real wage is after all a ratio of prices that are determined in two separate markets. Firms also are unlikely to risk the wrath of their existing workforce by capriciously exploiting slack labour markets to negotiate lower money wages for all even if it was institutionally possible to do so. Additionally, if all workers cut the ‘real wage’ then the fallacy of composition inherent in neoclassical economics binds because wages are both a cost (supply) and an income (demand). It is uncertain what the final outcome of demand and supply shifts would be but it is likely that the neoclassical policy solution that ‘across the board’ real wage cuts will reduce unemployment is prone to fail. Point B can be constructed as an equilibrium outcome, in the sense that once attained the economy would remain there unless something else changed. This violates the belief implicit in the second concept of equilibrium discussed above that market forces will resolve any discrepancy between supply and demand. However, at point B, the labour supply function has no bearing on the labour market outcome. At Point B all the firms are realising their expectations of for aggregate demand and therefore have no reason to revise their production plans or to increase employment. The economy is in underemployment equilibrium, and it is not a mistake. So what drives the economy to this underemployment equilibrium where workers are involuntarily unemployed? Modern Monetary Theory (MMT) shows us clearly that involuntary unemployment arises when the private sector, in aggregate, desires to earn the monetary unit of account, but doesn’t desire to spend all it earns. Firms do not hire because they cannot sell the output that would be produced. In this situation, nominal (or real) wage cuts per se do not clear the labour market, unless those cuts somehow eliminate the desire of the private sector to net save, and thereby increase (investment) spending. Please read my blog – What causes mass unemployment? – for more discussion on this point. Their work has made it harder for governments to maintain full employment and their analysis – which is full of holes and misrepresentations has been used to justify supply-side policies which deny mass unemployment and which focus on the victims of the job shortage rather than the true cause. They are worthy choices for a Nobel Prize – so bad is their work. Krugman claims that the award is “A happy day for economic theory”. Given he has been claiming that the current problem is largely due to a failure of aggregate demand I wonder why he is so willing to laud a body of theory that has downplayed (excluded) the role of demand in causing mass unemployment. Why given credit to economists who deny the basic causes of unemployment and, instead, propose policies which have attacked the victims of the systemic failure to produce enough jobs – the unemployed themselves? My view is that this award is a celebration of what is among the most obscene aspects of mainstream economic theory. Great explanation, Prof Mitchell. However, it is depressing that such work is still being lauded. Am I imagining things or does Dean Baker only need one more gentle nudge? Thanks for this blog Bill, I’m going to come back and try to study it. I have heard psychologists talk of “human needs” and that one of these is a person’s “need” to structure their day, and one of the main ways people express that need is to work. This seems to imply (to me at least) that when a person is able to express that ‘need’ they will! Things which can get in the way of this spontaneous expression are probably: environment / circumstances; social (including stigma and prejudice) and mental/physical health problems. It would be interesting to see to what extent MMT is conciously or unconciously inspired by a good understanding of human behaviour. I note you have referred to ‘behavioural economics’ before, perhaps you have contacts in this field that can find empirical evidence to back my belief that: ‘the desire to work is normally a spontaneous expression of a human need to structure one’s day where no obstacles to this expression exist’. Showing that MMT is consistent with firm evidence about human behaviour would strengthen its credibility. As an aside, I’d love to know who you have been meeting in London, but you are probably not allowed to tell me – i’m hoping it is the government or opposition. I have just found out that the UK has abandoned its sovereignty along with the Eurozone by signing the Maastricht Treaty. Apparently the UK is required by the terms of the treaty to issue debt matching its deficit – we may as well have adopted the Euro!? Great post! Thanks. Confirms my initial impression. Thanks Stephan, I was about to loose all hope. Presumably, if the UK government decides that it has no “borrowing requirement” then there is no real problem. The Nobel did make me laugh. I now have a collection of 5 friends who all hold doctorates and are unable to find any kind of work. If they aim for ‘middle salary’ or high salary work, they are aiming too high, apparently. If they aim to the bottom, they are aiming too low. Those still in work are quivering and have been for two years. The lack of intellectual rigour in too many seats of power is astounding and quite frightening. Off topic and you probably already know this. The prize in economic isn’t actually one of the real Nobel prizes. It´s in _memory_ of Alfred Nobel and was established as late as 1968 by the Sweden’s central bank. The real Nobel prizes are physics, chemistry, medicine, literature and for work in peace. The prize in economic sciences is riding on the prestige of the other real ones. There has been another attempt to extend the number of prizes, the Polar music applied to be like the prize in economic sciences but wasn’t accepted. Personally I think they should bury this fake Nobel prize. I’ve known all along if you make men hungry enough. Businesses will eventually hire two men to do one mans work, at half the cost! One weakling to bring the pick up, while the other swings it down. Where’s my Nobel prize? When an Asian company was taking market share from the company I worked for in the 80’s. A common supplier informed us: During a site vist he saw twice as many workers on each standard product line. They were still cheaper. Further insight into the cunning plan of the Neo-Liberal elites. Drag the workforce down to compete directly with Chinese workers. I have some difficulties with Macro interpretations of wages and unemployment that I have yet to see addressed in any modelling. I think they are important so most interested to be pointed in the right direction: firstly, the aggregated labour market does not seem to take account of any lack of tranferrability of skills between different industries that make up that that aggregated market. Similarly there are people who will/can not work at any wage, but are still counted as looking for work. Also people who are unemployed may not be employable because they lack the skills for the available jobs. All of these issues can be addressed, but they take time. Surely then “structural unemployment” is simply a reflection of this skills gap? gavinffirstly, the aggregated labour market does not seem to take account of any lack of tranferrability of skills between different industries that make up that that aggregated market. The idea that workers are transferrable among jobs, e.g., consumer market to capital market, underlies the erroneous notion that the labor market automatically corrects during consumption slumps, when interest rates drop and capital spending supposedly automatically increases. It is a myth with no empirical basis, as Bill and others have observed, not only owing to non-transferrable skills but also relocation difficulties. There needs to be a realistic mechanism to absorb the surplus labor. Similarly there are people who will/can not work at any wage, but are still counted as looking for work. Also people who are unemployed may not be employable because they lack the skills for the available jobs. This is a huge structural problem in the US among minorities that have systematically been excluded from society and effectively forced into ghetto conditions with scant chance to escape. This is a social and political problem as much as an economic one, and society is apparently not yet ready to address it even though it is chronic. Blame the victim is still the response for the most part. Until society recognizes that it has an intractable problem this probably won’t change much. gavinf: Surely then “structural unemployment” is simply a reflection of this skills gap? Surely not. Structural unemployment is a reflection of societies that give all power and wealth to banksters. Today’s unemployment stems from a collapse in demand. Bill attacks the “skills mismatch” argument at The structural mismatch propaganda is spreading … again! , note “My basic proposition was that persistently weak aggregate demand creates a labour market, which mimics features conventionally associated with structural problems.” see also Paul Krugman’s Hangover Theory At The Fed mentioned there. On Tom’s last point, see Black Teen Employment Hits Record Low and No One Notices . Not shocking until you realize that is an employment rate, not an unemployment rate. Thanks for the responses. I am not advocating for the concept of structural unemployment! I think the things I am describing are part of the cyclical structure, Just trying to understand what I see as someone working in labour market policy, to these economic ideas.